"Extinguisher" redirects here. Extinguisher may also refer to a candle snuffer. A fire extinguisher is an active fire protection device used to extinguish or control small fires, often in emergency situations. It is not intended for use on an out-of-control fire, such as one which has reached the ceiling, endangers the user (i.e., no escape route, smoke, explosion hazard, etc. ), or otherwise requires the expertise of a fire brigade. Typically, a fire extinguisher consists of a hand-held cylindrical pressure vessel containing an agent which can be discharged to extinguish a fire. Fire extinguishers manufactured with non-cylindrical pressure vessels also exist but are less common. There are two main types of fire extinguishers: stored-pressure and cartridge-operated. In stored pressure units, the expellant is stored in the same chamber as the firefighting agent itself. Depending on the agent used, different propellants are used. With dry chemical extinguishers, nitrogen is typically used; water and foam extinguishers typically use air. Stored pressure fire extinguishers are the most common type. Cartridge-operated extinguishers contain the expellant gas in a separate cartridge that is punctured prior to discharge, exposing the propellant to the extinguishing agent. This type is not as common, used primarily in areas such as industrial facilities, where they receive higher-than-average use. They have the advantage of simple and prompt recharge, allowing an operator to discharge the extinguisher, recharge it, and return to the fire in a reasonable amount of time. Unlike stored pressure types, these extinguishers use compressed carbon dioxide instead of nitrogen, although nitrogen cartridges are used on low temperature (-60 rated) models. Cartridge operated extinguishers are available in dry chemical and dry powder types in the U.S. and in water, wetting agent, foam, dry chemical (classes ABC and B.C. ), and dry powder (class D) types in the rest of the world. Fire extinguishers are further divided into handheld and cart-mounted (also called wheeled extinguishers). Handheld extinguishers weigh from 0.5 to 14 kilograms (1.1 to 30.9 lb), and are hence, easily portable by hand. Cart-mounted units typically weigh more than 23 kilograms (51 lb). These wheeled models are most commonly found at construction sites, airport runways, heliports, as well as docks and marinas. Fire extinguishers in a museum storeroom, cut to display their inner workings. A glass grenade-style extinguisher, to be thrown into a fire. A US copper building type soda-acid extinguisher. A US building-type chemical foam extinguisher with contents. A Pyrene, brass, carbon tetrachloride extinguisher. National Methyl Bromide extinguishers, UK, 1930s–40s. Bell Telephone CO2 extinguisher made by Walter Kidde, 1928. Du Gas cartridge-operated dry chemical extinguisher, 1945. Ansul Met-L-X cartridge-operated dry powder fire extinguisher for class D fires, 1950s. The first fire extinguisher of which there is any record was patented in England in 1723 by Ambrose Godfrey, a celebrated chemist at that time. It consisted of a cask of fire-extinguishing liquid containing a pewter chamber of gunpowder. This was connected with a system of fuses which were ignited, exploding the gunpowder and scattering the solution. This device was probably used to a limited extent, as Bradley's Weekly Messenger for November 7, 1729, refers to its efficiency in stopping a fire in London. The modern dry powder fire extinguisher was invented by British Captain George William Manby in 1818; it consisted of a copper vessel of 3 gallons (13.6 liters) of pearl ash (potassium carbonate) solution contained within compressed air. The soda-acid extinguisher was first patented in 1866 by Francois Carlier of France, which mixed a solution of water and sodium bicarbonate with tartaric acid, producing the propellant CO2 gas. A soda-acid extinguisher was patented in the U.S. in 1881 by Almon M. Granger. His extinguisher used the reaction between sodium bicarbonate solution and sulfuric acid to expel pressurized water onto a fire. A vial of concentrated sulfuric acid was suspended in the cylinder. Depending on the type of extinguisher, the vial of acid could be broken in one of two ways. One used a plunger to break the acid vial, while the second released a lead stopple that held the vial closed. Once the acid was mixed with the bicarbonate solution, carbon dioxide gas was expelled and thereby pressurized the water. The pressurized water was forced from the canister through a nozzle or short length of hose. The cartridge-operated extinguisher was invented by Read & Campbell of England in 1881, which used water or water-based solutions. They later invented a carbon tetrachloride model called the "Petrolex" which was marketed toward automotive use. The chemical foam extinguisher was invented in 1904 by Aleksandr Loran in Russia, based on his previous invention of fire fighting foam. Loran first used it to extinguish a pan of burning naphtha. It worked and looked similar to the soda-acid type, but the inner parts were slightly different. The main tank contained a solution of sodium bicarbonate in water, whilst the inner container (somewhat larger than the equivalent in a soda-acid unit) contained a solution of aluminium sulphate. When the solutions were mixed, usually by inverting the unit, the two liquids reacted to create a frothy foam, and carbon dioxide gas. The gas expelled the foam in the form of a jet. Although liquorice-root extracts and similar compounds were used as additives (stabilizing the foam by reinforcing the bubble-walls), there was no "foam compound" in these units. The foam was a combination of the products of the chemical reactions: sodium and aluminium salt-gels inflated by the carbon dioxide. Because of this, the foam was discharged directly from the unit, with no need for an aspirating branchpipe (as in newer mechanical foam types). Special versions were made for rough service, and vehicle mounting, known as apparatus of fire department types. Key features were a screw-down stopper that kept the liquids from mixing until it was manually opened, carrying straps, a longer hose, and a shut-off nozzle. Fire department types were often private label versions of major brands, sold by apparatus manufacturers to match their vehicles. Examples are Pirsch, Ward LaFrance, Mack, Seagrave, etc. These types are some of the most collectable extinguishers as they cross into both the apparatus restoration and fire extinguisher areas of interest. In 1910, The Pyrene Manufacturing Company of Delaware filed a patent for using carbon tetrachloride (CTC, or CCl4) to extinguish fires. The liquid vaporized and extinguished the flames by inhibiting the chemical chain reaction of the combustion process (it was an early 20th-century presupposition that the fire suppression ability of carbon tetrachloride relied on oxygen removal). In 1911, they patented a small, portable extinguisher that used the chemical. This consisted of a brass or chrome container with an integrated handpump, which was used to expel a jet of liquid towards the fire. It was usually of 1 imperial quart (1.1 l) or 1 imperial pint (0.57 l) capacity but was also available in up to 2 imperial gallons (9.1 l) size. As the container was unpressurized, it could be refilled after use through a filling plug with a fresh supply of CTC. Another type of carbon tetrachloride extinguisher was the fire grenade. This consisted of a glass sphere filled with CTC, that was intended to be hurled at the base of a fire (early ones used salt-water, but CTC was more effective). Carbon tetrachloride was suitable for liquid and electrical fires and the extinguishers were fitted to motor vehicles. Carbon tetrachloride extinguishers were withdrawn in the 1950s because of the chemical's toxicity – exposure to high concentrations damages the nervous system and internal organs. Additionally, when used on a fire, the heat can convert CTC to phosgene gas, formerly used as a chemical weapon. The carbon dioxide (CO2) extinguisher was invented (at least in the US) by the Walter Kidde Company in 1924 in response to Bell Telephone's request for an electrically non-conductive chemical for extinguishing the previously difficult-to-extinguish fires in telephone switchboards. It consisted of a tall metal cylinder containing 7.5 pounds (3.4 kg) of CO2 with a wheel valve and a woven brass, cotton covered hose, with a composite funnel-like horn as a nozzle. CO2 is still popular today as it is an ozone-friendly clean agent and is used heavily in film and television production to extinguish burning stuntmen. Carbon dioxide extinguishes fire mainly by displacing oxygen. It was once thought that it worked by cooling, although this effect on most fires is negligible. In 1928, DuGas (later bought by ANSUL) came out with a cartridge-operated dry chemical extinguisher, which used sodium bicarbonate specially treated with chemicals to render it free-flowing and moisture-resistant. It consisted of a copper cylinder with an internal CO2cartridge. The operator turned a wheel valve on top to puncture the cartridge and squeezed a lever on the valve at the end of the hose to discharge the chemical. This was the first agent available for large-scale three-dimensional liquid and pressurized gas fires, but remained largely a specialty type until the 1950s, when small dry chemical units were marketed for home use. ABC dry chemical came over from Europe in the 1950s, with Super-K being invented in the early 60s and Purple-K being developed by the US Navy in the late 1960s. Manually applied dry agents such as graphite for class D (metal) fires had existed since WWII, but it wasn't until 1949 that Ansul introduced a pressurized extinguisher using an external CO2 cartridge to discharge the agent. Met-L-X (sodium chloride) was the first extinguisher developed in the US, with graphite, copper, and several other types being developed later. In the 1940s, Germany invented the liquid chlorobromomethane (CBM) for use in aircraft. It was more effective and slightly less toxic than carbon tetrachloride and was used until 1969. Methyl bromide was discovered as an extinguishing agent in the 1920s and was used extensively in Europe. It is a low-pressure gas that works by inhibiting the chain reaction of the fire and is the most toxic of the vaporizing liquids, used until the 1960s. The vapor and combustion by-products of all vaporizing liquids were highly toxic and could cause death in confined spaces. In the 1970s, Halon 1211 came over to the United States from Europe where it had been used since the late 40s or early 50s. Halon 1301 had been developed by DuPont and the US Army in 1954. Both 1211 and 1301 work by inhibiting the chain reaction of the fire, and in the case of Halon 1211, cooling class A fuels as well. Halon is still in use today but is falling out of favor for many uses due to its environmental impact. Europe and Australia have severely restricted its use, since the Montreal Protocol of 1987. Less severe restrictions have been implemented in the United States, the Middle East, and Asia. Internationally there are several accepted classification methods for hand-held fire extinguisher. Each classification is useful in fighting fires with a particular group of fuel. Specifications for fire extinguishers are set out in the standard AS/NZS 1841, the most recent version being released in 2007. All fire extinguishers must be painted signal red. Except for water extinguishers, each extinguisher has a coloured band near the top, covering at least 10% of the extinguisher's body length, specifying its contents. In Australia, yellow (Halon) fire extinguishers are illegal to own or use on a fire, unless an essential use exemption has been granted, this is due to the ozone-depleting nature of halon. According to the standard BS EN 3, fire extinguishers in the United Kingdom as all throughout Europe are red RAL 3000, and a band or circle of a second color covering between 5–10% of the surface area of the extinguisher indicates the contents. Before 1997, the entire body of the fire extinguisher was color coded according to the type of extinguishing agent. Class A fires involve organic solids such as paper and wood. Class B fires involve flammable or combustible liquids, including petrol, grease, and oil. Class C fires involve flammable gases. Class D fires involve combustible metals. Class E fires involve electrical equipment/appliances. Class F fires involve cooking fat and oil. Class E has been discontinued, but covered fires involving electrical appliances. This is no longer used on the basis that, when the power supply is turned off, an electrical fire can fall into any of the remaining five categories. In the UK the use of Halon gas is now prohibited except under certain situations such as on aircraft and in the military and police. Fire extinguishing performance per fire class is displayed using numbers and letters such as 13A, 55B. EN3 does not recognise a separate electrical class - however there is an additional feature requiring special testing (35 kV dielectric test per EN 3-7:2004). A powder or CO2 extinguisher will bear an electrical pictogramme as standard signifying that it can be used on live electrical fires (given the symbol E in the table). If a water-based extinguisher has passed the 35 kV test it will also bear the same electrical pictogramme – however, any water-based extinguisher is only recommended for inadvertent use on electrical fires. There is no official standard in the United States for the color of fire extinguishers, though they are typically red, except for class D extinguishers which are usually yellow, water and Class K wet chemical extinguishers which are usually silver, and water mist extinguishers which are usually white. Extinguishers are marked with pictograms depicting the types of fires that the extinguisher is approved to fight. In the past, extinguishers were marked with colored geometric symbols, and some extinguishers still use both symbols. The types of fires and additional standards are described in NFPA 10: Standard for Portable Fire Extinguishers, 2013 edition. A Ordinary solid combustibles A for "Ash"
B Flammable liquids and gases B for "Barrel"
C Energized electrical equipment C for "Current"
D Combustible metals D for "Dynamite"
K Oils and fats K for "Kitchen"
Fire extinguishing capacity is rated in accordance with ANSI/UL 711: Rating and Fire Testing of Fire Extinguishers. The ratings are described using numbers preceding the class letter, such as 1-A:10-B:C. The number preceding the A multiplied by 1.25 gives the equivalent extinguishing capability in gallons of water. The number preceding the B indicates the size of fire in square feet that an ordinary user should be able to extinguish. There is no additional rating for class C, as it only indicates that the extinguishing agent will not conduct electricity, and an extinguisher will never have a rating of just C.
Fire extinguishers are typically fitted in buildings at an easily accessible location, such as against a wall in a high-traffic area. They are also often fitted to motor vehicles, watercraft, and aircraft - this is required by law in many jurisdictions, for identified classes of vehicles. Under NFPA 10 all commercial vehicles must carry at least one fire extinguisher, with size/UL rating depending on type of vehicle and cargo (i.e., fuel tankers typically must have a 20 lb (9.1 kg), while most others can carry a 5 lb (2.3 kg)). The revised NFPA 10 created criteria on the placement of "fast flow extinguishers" in locations such as those storing and transporting pressurized flammable liquids and pressurized flammable gas or areas with possibility of three-dimensional class B hazards are required to have "fast flow extinguishers" as required by NFPA 5.5.1.1. Varying classes of competition vehicles require fire extinguishing systems, the simplest requirements being a 1A:10BC hand-held portable extinguisher mounted to the interior of the vehicle. A dedicated trolley loaded with extinguishers ready to move where needed for rapid use. The height limit for installation, as determined by the National Fire Protection Association (NFPA), is 60 in (1.5 m) for fire extinguishers weighing less than 40 lb (18 kg). However, compliance with the Americans with Disabilities Act (ADA) also needs to be followed within the United States. The ADA height limit of the fire extinguisher, as measured at the handle, is 48 in (1.2 m). Fire extinguisher installations are also limited to protruding no more than 4 inches into the adjacent path of travel. The ADA rule states that any object adjacent to a path of travel cannot project more than 4 in (10 cm) if the object's bottom leading edge is higher than 27 in (0.69 m). The 4-inch protrusion rule was designed to protect people with low-vision and those who are blind. The height limit rule of 48 inches is primarily related to access by people with wheelchairs but it is also related to other disabilities as well. Prior to 2012, the height limit was 54 in (1.4 m) for side-reach by wheelchair-accessible installations. Installations made prior to 2012 at the 54-inch height are not required to be changed. In New Zealand, the mandatory installation of fire extinguishers in vehicles is limited to self-propelled plant in agriculture and arboriculture, passenger service vehicles with more than 12 seats and vehicles that carry flammable goods. NZ Transport Agency recommends that all company vehicles carry a fire extinguisher, including passenger cars. A small, disposable sodium bicarbonate dry chemical unit intended for home kitchen use. A typical dry chemical extinguisher containing 5 lb (2.3 kg). of monoammonium phosphate dry chemical. An 18 lb (8.2 kg) US Navy cartridge-operated purple-K dry chemical (potassium bicarbonate) extinguisher. Two Super-K (potassium chloride) extinguishers. Met-L-Kyl cartridge-operated fire extinguisher for pyrophoric liquid fires. This is a powder-based agent that extinguishes by separating the four parts of the fire tetrahedron. It prevents the chemical reactions involving heat, fuel, and oxygen (combustion), thus extinguishing the fire. During combustion, the fuel breaks down into free radicals, which are highly reactive fragments of molecules that react with oxygen. The substances in dry chemical extinguishers can stop this process. Monoammonium phosphate, also known as tri-class, multipurpose, or ABC dry chemical, used on class A, B and C fires. It receives its class A rating from the agent's ability to melt and flow at 177 °C (351 °F) to smother the fire. More corrosive than other dry chemical agents. Pale yellow in color. Sodium bicarbonate, regular or ordinary used on class B and C fires, was the first of the dry chemical agents developed. In the heat of a fire, it releases a cloud of carbon dioxide that smothers the fire. That is, the gas drives oxygen away from the fire, thus stopping the chemical reaction. This agent is not generally effective on class A fires because the agent is expended and the cloud of gas dissipates quickly, and if the fuel is still sufficiently hot, the fire starts up again. While liquid and gas fires do not usually store much heat in their fuel source, solid fires do. Sodium bicarbonate was very common in commercial kitchens before the advent of wet chemical agents, but now is falling out of favor as it is much less effective than wet chemical agents for class K fires, less effective than Purple-K for class B fires, and is ineffective on class A fires. White or blue in color. Potassium bicarbonate (principal constituent of Purple-K), used on class B and C fires. About two times as effective on class B fires as sodium bicarbonate, it is the preferred dry chemical agent of the oil and gas industry. The only dry chemical agent certified for use in ARFF by the NFPA. Colored violet to distinguish it. Potassium bicarbonate & Urea Complex (AKA Monnex), used on class B and C fires. More effective than all other powders due to its ability to decrepitate (where the powder breaks up into smaller particles) in the flame zone creating a larger surface area for free radical inhibition. Grey in color. Potassium chloride, or Super-K, dry chemical was developed in an effort to create a high efficiency, protein-foam compatible dry chemical. Developed in the 60s, prior to Purple-K, it was never as popular as other agents since, being a salt, it was quite corrosive. For B and C fires, white in color. Foam-compatible, which is a sodium bicarbonate (BC) based dry chemical, was developed for use with protein foams for fighting class B fires. Most dry chemicals contain metal stearates to waterproof them, but these will tend to destroy the foam blanket created by protein (animal) based foams. Foam compatible type uses silicone as a waterproofing agent, which does not harm foam. Effectiveness is identical to regular dry chemical, and it is light green in color (some ANSUL brand formulations are blue). This agent is generally no longer used since most modern dry chemicals are considered compatible with synthetic foams such as AFFF. MET-L-KYL / PYROKYL is a specialty variation of sodium bicarbonate for fighting pyrophoric (ignites on contact with air) liquid fires. In addition to sodium bicarbonate, it also contains silica gel particles. The sodium bicarbonate interrupts the chain reaction of the fuel and the silica soaks up any unburned fuel, preventing contact with air. It is effective on other class B fuels as well. Blue/red in color. Applied to fuel fires as either an aspirated (mixed and expanded with air in a branch pipe) or nonaspirated form to create a frothy blanket or seal over the fuel, preventing oxygen reaching it. Unlike powder, foam can be used to progressively extinguish fires without flashback. Aqueous film-forming foam (AFFF), used on A and B fires and for vapor suppression. The most common type in portable foam extinguishers. AFFF was developed in the 1960s under Project Light Water in a joint venture between 3M and the U.S. Navy. AFFF forms a film that floats out before the foam blanket, sealing the surface and smothering the fire by excluding oxygen. AFFF is widely used for ARFF firefighting at airports, often in conjunction with purple-K dry chemical.It contains fluoro-tensides which can be accumulated in the human body. The long-term effects of this on the human body and environment are unclear at this time. AFFF can be discharged through an air-aspirating branchpipe nozzle or a spray nozzle and is now produced only in pre-mix form, where the foam concentrate is stored mixed with water. In the past, as solid charge model was produced, where the AFFF concentrate was housed as a dry compound in an external, disposable cartridge in a specially designed nozzle. The extinguisher body was charged with plain water, and the discharge pressure mixed the foam concentrate with the water upon squeezing the lever. These extinguishers received double the rating of a pre-mix model (40-B instead of 20-B), but are now considered obsolete, as parts and refill cartridges have been discontinued by the manufacturer. Alcohol-resistant aqueous film-forming foams (AR-AFFF), used on fuel fires containing alcohol. Forms a membrane between the fuel and the foam preventing the alcohol from breaking down the foam blanket. Film-forming fluoroprotein (FFFP) contains naturally occurring proteins from animal by-products and synthetic film-forming agents to create a foam blanket that is more heat resistant than the strictly synthetic AFFF foams. FFFP works well on alcohol-based liquids and is used widely in motorsports. As of 2016, Amerex has discontinued production of FFFP, instead using AR-AFFF made by Solberg. Existing model 252 FFFP units can maintain their UL listing by using the new charge, but only the model 250 will be produced in the future. Compressed air foam system (CAFS): The CAFS extinguisher (example: TRI-MAX Mini-CAF) differs from a standard stored-pressure premix foam extinguisher in that it operates at a higher pressure of 140 psi, aerates the foam with an attached compressed gas cylinder instead of an air-aspirating nozzle, and uses a drier foam solution with a higher concentrate-to-water ratio. Generally used to extend a water supply in wildland operations. Used on class A fires and with very dry foam on class B for vapor suppression. These are very expensive, special purpose extinguishers typically used by fire departments or other safety professionals. Arctic Fire is a liquid fire extinguishing agent that emulsifies and cools heated materials more quickly than water or ordinary foam. It is used extensively in the steel industry. Effective on classes A, B, and D.
FireAde is a foaming agent that emulsifies burning liquids and renders them non-flammable. It is able to cool heated material and surfaces similar to CAFS. Used on A and B (said to be effective on some class D hazards, although not recommended due to the fact that fireade still contains amounts of water which will react with some metal fires). Cold Fire is an organic, eco-friendly wetting agent that works by cooling, and by encapsulating the hydrocarbon fuel, which prevents it from entering into the combustion reaction. Bulk Cold Fire is used in booster tanks and is acceptable for use in CAFS systems. Cold Fire is UL listed for A and B fires only, though the manufacturer claims it is effective on class D and "grease" fires, which implies class K capability. End users should be cautious about agents use on fires outside of their UL listing, despite sales claims. Aerosol versions are preferred by users for cars, boats, RVs, and kitchens. Used primarily by law enforcement, fire departments, EMS, and the racing industry across North America. Cold Fire offers Amerex equipment (converted 252 and 254 models) as well as imported equipment in smaller sizes. Cools burning material. Very effective against fires in furniture, fabrics, etc. (including deep-seated fires), but can be safely used only in the absence of electricity. Pump-Type water consists of a ​2 1⁄2- or 5-gallon non-pressurized metal or plastic container with a pump mounted to it, and a discharge hose and nozzle. Pump type water extinguishers are often used where freezing conditions may occur, as they can be economically freeze-protected with calcium chloride (except stainless steel models), such as barns, outbuildings and unheated warehouses. They are also useful where many, frequent spot fires may occur, such as during fire watch for hot work operations. They are dependent on the user's strength to produce a decent discharge stream for firefighting. Water and antifreeze are the most common, but loaded stream and foam designs were made in the past. Backpack models exist for wildland firefighting and may be solid material such as metal or fiberglass, or collapsible vinyl or rubber bags for ease of storage. Air-pressurized water (APW) cools burning material by absorbing heat from burning material. Effective on class A fires, it has the advantage of being inexpensive, harmless, and relatively easy to clean up. In the United States, APW units contain 2.5 US gal (9.5 l) of water in a tall, stainless steel cylinder. In Europe, they are typically mild steel, lined with polyethylene, painted red and contain 6–9 l (1.6–2.4 US gal) of water. Water mist (WM) uses a fine misting nozzle to break up a stream of de-ionized (distilled) water to the point of not conducting electricity back to the operator. Class A and C rated. It is used widely in hospitals and MRI facilities because it is both completely non-toxic and does not cause cardiac sensitization like some gaseous clean agents. These extinguishers come in 1-3/4 and 2-1/2 gallon sizes, painted white in the United States. Models used in MRI facilities are non-magnetic and are safe for use inside the room that the MRI machine is operating. Models available in Europe come in smaller sizes as well, and some even carry a Class F rating for commercial kitchens, essentially using steam to smother the fire and the water content to cool the oil. Wet chemical (potassium acetate, potassium carbonate, or potassium citrate) extinguishes the fire by forming an air-excluding soapy foam blanket over the burning oil through the chemical process of saponification (an alkali reacting with a fat to form a soap) and by the water content cooling the oil below its ignition temperature. Generally, class A and K (F in Europe) only, although older models also achieved class B and C fire-fighting capability in the past, current models are rated A:K (Amerex, Ansul, Buckeye and Strike First) or K only (Badger/Kidde). Wetting agents: Detergent based additives used to break the surface tension of water and improve penetration of class A fires. Antifreeze chemicals added to water to lower its freezing point to about −40 °F (−40 °C). Has no appreciable effect on extinguishing performance. Can be glycol based or loaded stream, see below. Loaded Stream An alkali metal salt solution added to water to lower its freezing point to about −40 °F (−40 °C). Loaded stream is basically concentrated wet chemical, discharged through a straight stream nozzle, intended for class A fires. In addition to lowering the freezing point of the water, loaded stream also increases penetration into dense class A materials, and will give a slight class B rating (rated 1-B in the past), though current loaded stream extinguishers are rated only 2-A. Loaded Stream is very corrosive; extinguishers containing this agent must be recharged annually to check for corrosion. Clean agents extinguish fire by displacing oxygen (CO2 or inert gases), removing heat from the combustion zone (Halotron-1, FE-36, Novec 1230) or inhibiting the chemical chain reaction (Halons). They are referred to as clean agents because they do not leave any residue after discharge which is ideal for protecting sensitive electronics, aircraft, armored vehicles and archival storage, museums, and valuable documents. Halon (including Halon 1211 and Halon 1301), are gaseous agents that inhibit the chemical reaction of the fire. Classes B:C for 1301 and smaller 1211 fire extinguishers (2.3 kg; under 9 lbs) and A:B:C for larger units (9–17 lb or 4.1–7.7 kg). Halon gases are banned from new production under the Montreal Protocol, as of January 1, 1994 as its properties contribute to ozone depletion and long atmospheric lifetime, usually 400 years. Halon may be recycled and used to fill newly manufactured cylinders, however, only Amerex continues to do this. The rest of the industry has moved to halon alternatives, nevertheless, halon 1211 is still vital to certain military and industrial users, so there is a need for it. Halon was completely banned in Europe and Australia except for critical users like law enforcement and aviation, resulting in stockpiles either being destroyed via high heat incineration or being sent to the United States for reuse. Halon 1301 and 1211 are being replaced with new halocarbon agents which have no ozone depletion properties and low atmospheric lifetimes, but are less effective. Halon 2402 is a liquid agent (dibromotetrafluoroethane) which has had limited use in the West due to its higher toxicity than 1211 or 1301. It is widely used in Russia and parts of Asia, and it was used by Kidde's Italian branch, marketed under the name "Fluobrene". Halocarbon replacements, HCFC Blend B (Halotron I, American Pacific Corporation), HFC-227ea (FM-200, Great Lakes Chemicals Corporation), and HFC-236fa (FE-36, DuPont), have been approved by the FAA for use in aircraft cabins in 2010. Considerations for halon replacement include human toxicity when used in confined spaces, ozone depleting potential, and greenhouse warming potential. The three recommended agents meet minimum performance standards, but uptake has been slow because of disadvantages. Specifically, they require two to three times the concentration to extinguish a fire compared with Halon 1211. They are heavier than halon, require a larger bottle because they are less effective, and have greenhouse gas potential. Research continues to find better alternatives. CO2, a clean gaseous agent which displaces oxygen. Highest rating for 20 lb (9.1 kg) portable CO2 extinguishers is 10B:C. Not intended for class A fires, as the high-pressure cloud of gas can scatter burning materials. CO2 is not suitable for use on fires containing their own oxygen source, metals or cooking media. Although it can be rather successful on a person on fire, its use should be avoided where possible as it can cause frostbite and suffocation. Novec 1230 fluid (AKA dry water, or Saffire fluid), a fluorinated ketone that works by removing massive amounts of heat. Available in fixed systems and wheeled units in the US and in portables in Australia. Unlike other clean agents this one has the advantage of being a liquid at atmospheric pressure and can be discharged as a stream or a rapidly vaporizing mist, depending on application. Potassium aerosol particle-generator, contains a form of solid potassium salts and other chemicals referred to as aerosol-forming compounds (AFC). The AFC is activated by an electric current or other thermodynamic exchange which causes the AFC to ignite. The majority of installed currently are fixed units due to the possibility of harm to the user from the heat generated by the AFC generator. E-36 Cryotec, a type of high concentration, high-pressure wet chemical (potassium acetate and water), it is being used by the U.S. Military in applications like the Abrams tank to replace the aging halon 1301 units previously installed. Ansul 30lb. Na-X cartridge-operated sodium carbonate fire extinguisher for sodium fires using non-corrosive agent. Ternary Eutectic Chloride fire extinguisher for metal fires, UK. There are several class D fire extinguisher agents available; some will handle multiple types of metals, others will not. Sodium chloride (Super-D, Met-L-X, M28, Pyrene Pyromet*) contains sodium chloride salt, which melts to form an oxygen-excluding crust over the metal. A thermoplastic additive such as nylon is added to allow the salt to more readily form a cohesive crust over the burning metal. Useful on most alkali metals including sodium and potassium, and other metals including magnesium, titanium, aluminum, and zirconium. Copper-based (Copper Powder Navy 125S) developed by the U.S. Navy in the 1970s for hard-to-control lithium and lithium-alloy fires. The powder smothers and acts as a heat sink to dissipate heat, but also forms a copper-lithium alloy on the surface which is non-combustible and cuts off the oxygen supply. Will cling to a vertical surface. Lithium only. Graphite-based (G-Plus, G-1, Lith-X, Chubb Pyromet) contains dry graphite that smothers burning metals. The first type developed, designed for magnesium, works on other metals as well. Unlike sodium chloride powder extinguishers, the graphite powder fire extinguishers can be used on very hot burning metal fires such as lithium, but unlike copper powder extinguishers will not stick to and extinguish flowing or vertical lithium fires. Like copper extinguishers, the graphite powder acts as a heat sink as well as smothering the metal fire. Sodium carbonate-based (Na-X) is used where stainless steel piping and equipment could be damaged by sodium chloride-based agents to control sodium, potassium, and sodium-potassium alloy fires. Limited use on other metals. Smothers and forms a crust. Ternary eutectic chloride (T.E.C.) dry powder is a dry powder invented in 1959 by Lawrence H Cope, a research metallurgist working for the UK Atomic Energy Authority, and licensed to John Kerr Co. of England. It consists of a mixture of three powdered salts: sodium, potassium and barium chloride. T.E.C. forms an oxygen-excluding layer of molten salt on the metal's surface. Along with Met-L-X (sodium chloride), T.E.C has been reported to be one of the most effective agents for use on sodium, potassium, and NaK fires, and is used specifically on atomic metals like uranium and plutonium as it will not contaminate the valuable metal unlike other agents. T.E.C. is quite toxic, due to the barium chloride content, and for this reason is no longer used in the UK, and was never used in the US aside from radioactive material handling glove boxes, where its toxicity was not an issue due their confined nature. T.E.C. is still widely used in India, despite toxicity, while the West uses chiefly sodium chloride, graphite, and copper types of powder and considers T.E.C. obsolete. Trimethoxyboroxine (TMB) liquid is a boron compound dissolved in methanol to give it proper fluidity and allow it to be discharged from a portable fire extinguisher. It was developed in the late 1950s by the U.S. Navy for use on magnesium fires, especially crashed aircraft and aircraft wheel fires from hard landings. It is unique as an extinguishing agent in that the agent itself is a flammable liquid. When TMB contacts the fire, the methanol ignites and burns with a greenish flame due to the boron. As the methanol burns off, a glassy coating of boric oxide is left on the surface of the metal, creating an air-excluding crust. These extinguishers were made by the Ansul Chemical Co. utilizing TMB agent manufactured by the Callery Chemical Company, and were modified 2.5-gallon water extinguishers (Ansul used re-branded Elkhart extinguishers at the time), with a variable-stream nozzle that could deliver a straight stream or spray at the squeeze of a lever. A 6-inch fluorescent orange band with the letters "TMB" stenciled in black identified TMB from other extinguishers. This agent was problematic in that it had a shelf life of only six months to a year once the extinguisher was filled, since the methanol is extremely hygroscopic (absorbs moisture from the air), which causes corrosion to the extinguisher and renders its use on fire dangerous. These extinguishers were used from the 1950s–70s in various applications, such as the MB-1 and MB-5 crash trucks. TMB was used experimentally by the US Air Force, specifically with regard to B-52 engine assemblies, and was tested in modified 10-gallon wheeled CBM extinguishers. Other agents were added to suppress the methanol flare up, such as chlorobromomethane (CBM), Halon 2402, and Halon 1211, with varied success. Halon 1211 was the most successful, and the combined TMB pressurized with halon 1211 and nitrogen was called Boralon was used experimentally by the Los Alamos National Laboratory for use on atomic metals, using sealed cylinder extinguishers made by Metalcraft and Graviner which eliminated the moisture contamination problem. TMB/Boralon was abandoned in favor of more versatile agents, though it is still mentioned in most US firefighting literature. Buffalo M-X liquid was a short-lived oil-based extinguishing agent for magnesium fires, made by Buffalo in the 1950s. It was discovered by the Germans in WWII that a heavy oil could be applied to burning magnesium chips to cool and smother them, and was easy to apply from a pressurized extinguisher, which was made by the German firm Total. After the war, the technology was more generally disseminated. Buffalo marketed a 2.5-gallon and 1-quart extinguisher using M-X liquid discharged through a low-velocity shower head type nozzle but it was met with limited success, as it was going up against Ansul's Met-L-X, which could be used on more types of metals and was non-combustible. M-X had the advantage of being easy to recharge and non-corrosive since it was oil-based, but production did not last long due to its limited applications. Some water-based suppressants may be used on certain class D fires, such as burning titanium and magnesium. Examples include the Fire Blockade and FireAde brands of suppressant. Some metals, such as elemental lithium, will react explosively with water, therefore water-based chemicals should never be used on such fires due to the possibility of a violent reaction. Most class D extinguishers will have a special low-velocity nozzle or discharge wand to gently apply the agent in large volumes to avoid disrupting any finely divided burning materials. Agents are also available in bulk and can be applied with a scoop or shovel. Note. "Pyromet" is a trade name that refers to two separate agents. Invented by Pyrene Co. Ltd. (UK) in the 1960s, it was originally a sodium chloride formulation with monoammonium phosphate, protein, clay and waterproofing agents. Modern Pyromet made by Chubb Fire is a graphite formulation. Several modern "ball" or grenade-style extinguishers are available on the market. The modern version of the ball is a hard foam shell, wrapped in fuses that lead to a small black powder charge within. The ball bursts shortly after contact with flame, dispersing a cloud of ABC dry chemical powder which extinguishes the fire. The coverage area is about 5 m2 (54 sq ft). One benefit of this type is that it may be used for passive suppression. The ball can be placed in a fire-prone area and will deploy automatically if a fire develops, being triggered by heat. They may also be manually operated by rolling or tossing into a fire. Most modern extinguishers of this type are designed to make a loud noise upon deployment. This technology is not new, however. In the 1800s, glass fire grenades filled with suppressant liquids were popular. These glass fire grenade bottles are sought by collectors. Some later brands, such as Red Comet, were designed for passive operation, and included a special holder with a spring-loaded trigger that would break the glass ball when a fusible link melted. As was typical of this era, some glass extinguishers contained the toxic carbon tetrachloride. Condensed aerosol fire suppression is a particle-based form of fire extinction similar to gaseous fire suppression or dry chemical fire extinction. As with gaseous fire suppressants, condensed aerosol suppressants use clean agents to suppress the fire. The agent can be delivered by means of mechanical operation, electric operation, or combined electro-mechanical operation. To the difference of gaseous suppressants, which emit only gas, and dry chemical extinguishers, which release powder-like particles of a large size (25–150 µm) condensed aerosols are defined by the National Fire Protection Association as releasing finely divided solid particles (generally <10 µm), usually in addition to gas. Whereas dry chemical systems must be directly aimed at the flame, condensed aerosols are flooding agents and therefore effective regardless of the location and height of the fire. Wet chemical systems, such as the kind generally found in foam extinguishers, must, similarly to dry chemical systems, be sprayed directionally, onto the fire. Additionally, wet chemicals (such as potassium carbonate) are dissolved in water, whereas the agents used in condensed aerosols are microscopic solids. In 2015, researchers from George Mason University announced that high volume sound with low bass frequencies in the 30 to 60 hertz range drives oxygen away from the combustion surface, extinguishing the fire, a principle was previously tested by the Defense Advanced Research Projects Agency (DARPA). One proposed application is to extinguish fires in outer space, with none of the clean-up required for mass-based systems. Another proposed solution for fire extinguishers in space is a vacuum cleaner that extracts the combustible materials. An empty fire extinguisher which was not replaced for years. Most countries in the world require regular fire extinguisher maintenance by a competent person to operate safely and effectively, as part of fire safety legislation. Lack of maintenance can lead to an extinguisher not discharging when required, or rupturing when pressurized. Deaths have occurred, even in recent times, from corroded extinguishers exploding. In the United States, state and local fire codes, as well as those established by federal agencies such as the Occupational Safety and Health Administration, are generally consistent with standards established by the National Fire Protection Association (NFPA). They commonly require, for fire extinguishers in all buildings other than single-family dwellings, inspections every 30 days to ensure the unit is pressurized and unobstructed (done by an employee of the facility) and an annual inspection and service by a qualified technician. Some jurisdictions require more frequent service. The servicer places a tag on the extinguisher to indicate the type of service performed (annual inspection, recharge, new fire extinguisher). Hydrostatic pressure testing for all types of extinguishers is also required, generally every five years for water and CO2 models up to every 12 years for dry chemical models. Recently the NFPA and ICC voted to allow for the elimination of the 30-day inspection requirement so long as the fire extinguisher is monitored electronically. According to NFPA, the system must provide record keeping in the form of an electronic event log at the control panel. The system must also constantly monitor an extinguisher's physical presence, internal pressure and whether an obstruction exists that could prevent ready access. In the event that any of the above conditions are found, the system must send an alert to officials so they can immediately rectify the situation. Electronic monitoring can be wired or wireless. Basic service: All types of extinguisher require a basic inspection annually to check weight, externally validate the correct pressure, and find any signs of damage or corrosion. Cartridge extinguishers are to be opened up for internal inspection, and to have the weight of the cartridge tested. Labels must be inspected for legibility, and where possible, dip tubes, hoses and mechanisms must be tested for clear, free operation. Extended service: Water, wet chemical, foam, and powder extinguishers require a more detailed examination every five years, including a test discharge and recharge. On stored pressure extinguishers, this is the only opportunity to internally inspect for damage/corrosion. Overhaul: CO2 extinguishers, due to their high operating pressure, are subject to pressure vessel safety legislation, and must be hydraulic pressure tested, inspected internally and externally, and date stamped every 10 years. As it cannot be pressure tested, a new valve is also fitted. If any part of the extinguisher is replaced with a part from another manufacturer, then the extinguisher will lose its fire rating. Maintenance inspection: All types of extinguishers should be inspected at least once a year. The extinguisher is checked that it has the correct volume and pressure of extinguishing agent, that it is within the required hydrotest and internal maintenance intervals, that it is in good condition, and that all external parts are still serviceable. Dry chemical and dry powder types may also be hit on the bottom with a rubber mallet to make sure the powder is free-flowing. After inspection, the tech will attach a new tamper seal and yearly service tag around the pin. Halon and clean agents – every 6 years. The extinguisher is emptied of its chemical and pressure to check for proper operation. All components are disassembled, inspected, cleaned, lubricated, or replaced if defective. Liquid agents are replaced at this time, dry agents may be re-used if in good condition, halon is recovered and re-used, but CO2 is discharged into the atmosphere. The extinguisher is then re-filled and recharged, after a "verification of service" collar is placed around the cylinder neck. It is impossible to properly install or remove a collar without depressurizing the extinguisher. Note: Cartridge-operated extinguishers should be visually examined, but do not require a verification of service collar. Hydrostatic testing: Water, foam, wet chemical and CO2, every 5 years. Dry chemical, dry powder, halon and clean agents, every 12 years. Note: these are the required intervals for normal service conditions, if the extinguisher has been exposed to excessive heat, vibration, or mechanical damage it may need to be tested sooner. The agent is emptied and depressurized and the valve is removed. After a thorough internal and external visual inspection, the cylinder is filled with water, placed inside a safety cage, and pressurized to the specified test pressure (varies with the type, age, and cylinder material) for the specified time period. If no failure, bulges, or leaks are detected, the cylinder passes. The cylinder is then emptied of water and thoroughly dried, and labeled with the test date and company that performed the test. CO2 types have the test information stamped on the cylinder, all other types get a sticker on the back of the cylinder. Once dry, the units are recharged. Unlike the UK, the US does not rebuild extinguishers and replace valves at specific intervals unless parts are found to be defective, with the exception of halon. Halon types are often given new o-rings and valve stems at every internal maintenance to minimize any leakage potential. OEM equipment must be used for replacement parts for the extinguisher to maintain its UL rating. If parts are unavailable, replacement is recommended, keep in mind extinguishers have a projected service life of about 25–35 years, although many are of such quality that they can outlast this, but realize that science is ever-changing, and something that was the best available 30 years ago may not be acceptable for modern fire protection needs. Fire extinguishers are sometimes a target of vandalism in schools and other open spaces. Extinguishers are occasionally partially, or fully discharged by a vandal, impairing the extinguisher's actual fire-fighting abilities. In open public spaces, extinguishers are ideally kept inside cabinets that have glass that must be broken to access the extinguisher, or which emit an alarm siren that cannot be shut off without a key, to alert people the extinguisher has been handled by an unauthorized person if a fire is not present. This also alerts maintenance to check an extinguisher for usage so that it may be replaced if it has been used. Fire extinguisher identification signs are small signs designed to be mounted near a fire extinguisher, in order to draw attention to the extinguisher's location (e.g., if the extinguisher is on a large pole, the sign would generally be at the top of the pole so it can be seen from a distance). Such signs may be manufactured from a variety of materials, commonly self-adhesive vinyl, rigid PVC, and aluminum. 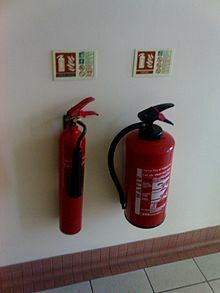 In addition to words and pictographs indicating the presence of a fire extinguisher, some modern extinguisher identification signs also describe the extinguishing agent in the unit, and summarize the types of fire on which it may safely be used. Some public and government buildings are often required, by local legal codes, to provide an identification sign for each extinguisher on the site. Similar signs are available for other fire equipment (including fire blankets and fire hose reels/racks), and for other emergency equipment (such as first aid kits). Most licensing authorities have regulations describing the standard appearance of these signs (e.g., text height, pictographs used and so on). Photoluminescent fire extinguisher signs are made with nontoxic photoluminescent phosphor that absorbs ambient light and releases it slowly in dark conditions – the sign "glows in the dark". Such signs are independent of an external power supply, and so offer a low-cost, reliable means of indicating the position of emergency equipment in dark or smoky conditions. The luminance performance for life safety appliance location signs should meet the requirements of International Standard ISO 17398 so that the sign is not only excited at very low ambient light levels (25 lux), but also has effective luminance intensity and longevity, making the life-safety message conspicuous in the event of power failure, or if smoke obscures emergency ceiling lights. The Photoluminescent Safety Products Association (PSPA) has guidance classifications for luminance performance to help users with applications under "International Maritime Organization Emergency Equipment and Life-saving Appliance Location Requirements," and worldwide industrial fire-safety management requirements. Photo-luminescent signs are sometimes wrongfully described as being reflective. A reflective material will only return ambient light for as long as the light source is supplied, rather than storing energy and releasing it over a period of time. But, many fire extinguishers and extinguisher-mounting posts have strips of retroreflective adhesive tape placed on them to facilitate their location in situations where only emergency lighting or flashlights are available. ^ "Staffordshire Past Track – "Petrolex" half gallon fire extinguisher". Retrieved 2009-05-25. ^ U.S. Patent 1,010,870, filed April 5, 1910. ^ U.S. Patent 1,105,263, filed Jan 7, 1911. ^ "Pyrene Fire Extinguishers". Vintage Fire Extinguishers. Archived from the original on 25 March 2010. Retrieved 23 December 2009. ^ "Carbon Tetrachloride Health and Safety Guide". IPCS International Programme on Chemical Safety. Retrieved 25 December 2009. ^ U.S. Patent 1,760,274, filed Sept 26, 1925. ^ McCarthy, Robert E (1992-06-18). Secrets of Hollywood special effects. ISBN 978-0-240-80108-7. Retrieved 2010-03-17 – via Google Books. ^ "Halon Disposal". Ozone Protection. Australian Government Department of the Environment and Heritage (Australia). Retrieved 2006-12-12. ^ "ExtinguisherServicing – Everything you need to know". Retrieved 19 November 2016. ^ "The Fire Safety Advice Centre". ^ "Disposal Of Halon – Envirowise". ^ "Do you need to carry a fire extinguisher in a company vehicle?". ^ "Your safe driving policy" (PDF). ^ "Handheld Fire Extinguishers". Retrieved 2012-04-09. ^ "Options to the Use of Halons for Aircraft Fire Suppression Systems – 2012 Update" (PDF). p. 11. Retrieved 2012-04-09. ^ "Options to the Use of Halons for Aircraft Fire Suppression Systems – 2012 Update" (PDF). p. xvii. Retrieved 2012-04-09. ^ U.S. Patent 3,095,372, filed July 5, 1960. UK Patent GB884946. ^ "The Non Numismatic Bibliography of Dr L.H. Cope". Retrieved 19 November 2016. ^ Extinguishment of Alkali Metal Fires, S.J. Rodgers and W.A. Everson, Technical Documentary Report APL-TDR 64-114, Air Force Laboratory, Wright-Patterson Air Force Base, Ohio, 1964, pp. 28–31. ^ Personnel, United States Bureau of Naval (1 January 1959). "Aviation Boatswain's Mate 1 & C: Navy Training Courses". U.S. Government Printing Office. Retrieved 19 November 2016 – via Google Books. ^ JIOA Final Report 41. "German Chemical Fire Extinguishers", Joint Intelligence Objectives Agency, Smith, Carlisle F, Washington DC, October 1945. ^ "Fireade 2000 Applications". Retrieved 2009-11-10. ^ Chuck a ball to put out fire. Earth Times. 14 September 2007. ^ "firegrenade.com". firegrenade.com. 2007-08-23. Retrieved 2012-08-04. ^ National Fire Protection Association, "Report on Aerosol Extinguishing Technology,". ^ "Dousing flames with low-frequency sound waves". Physics World. 2 April 2015. ^ Conrad, Henry (March 25, 2015). "Two students created a device that extinguishes fires with soundwaves". ZME Science. Retrieved March 25, 2015. ^ Nakumura, Yuji. "Novel Fire Extinguisher Method Using Vacuuming Force Applicable to Space Habitats". Fire Technology. Retrieved 25 April 2019. ^ Charpentier, Will. "NFPA Regulations on Fire Extinguishers". HomeSteady. Leaf Group. Retrieved 23 June 2018. ^ "CAIS16 – Safety signs in the catering industry" (PDF). Archived from the original (PDF) on April 17, 2012. Retrieved 2012-08-04. Dana, Gorham (1919), Automatic Sprinkler Protection (second ed. 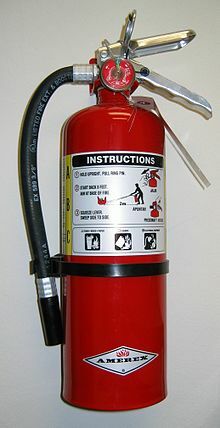 ), John Wiley & Sons, Inc.
Wikimedia Commons has media related to Fire extinguisher. This page was last edited on 25 April 2019, at 15:12 (UTC).